The adhesive label is mainly composed of three layers: surface material, adhesive and base paper (coated with silicone oil). The ideal condition for die-cutting is to cut through the adhesive layer, but not to destroy the silicone oil layer, which is called “precision die cutting”. Paper type of self-adhesive label processing is: unwinding – first hot stamping and then printing (or first printing and then hot stamping) – varnishing – laminating– punching – die-cutting –receiving paper. However, in the actual production process, it is impossible to achieve such an ideal situation by the influence of the factors of adhesive materials, tools, machines and operators. Usually, the phenomenon of bottom paper cutting through, die cutting spacing instability, die cutting process missing labels and poor waste discharge are often found. It can be seen that the traditional tool die cutting process is very complex, not only the bottom paper cutting through, spacing instability, missing labels and waste labels, but also the tool flexibility is poor, big error, cost savings, waste of labors and other defects. 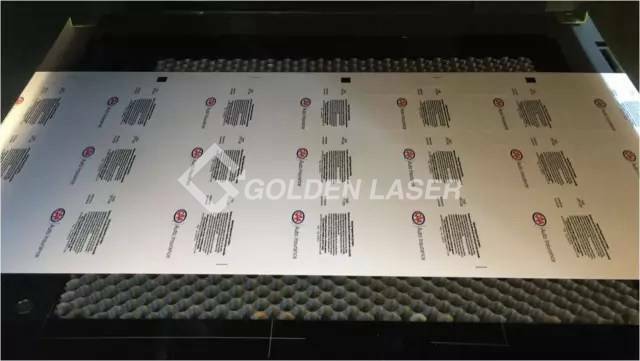 Therefore, in order to solve these problems, laser die-cutting solutions in the printing stickers label industry turned out. GOLDEN LASER is the first company in China to bring digital laser die-cutting technology into the printing and packaging industry. Its research and development of modular multi-station integrated high-speed laser die-cutting system, can replace the traditional tool die-cutting machine, Slitter, laminating machine, Varnish flexo machine, drilling machine, rewinding machine, and a series of traditional function of a single machine. High speed laser die cutting system, can be completed simultaneously flexo printing, laminating, cutting, half-cutting, marking, punching, engraving, serial number consecutively, hot stamping, slitting and other processes. Laser die cutting speed up to 120 m/min. Use CAD software or graphics software to generate DXF or AI file format, direct import laser die-cutting machine software operating system. In the software set cutting laser power, speed and processing quantity and other parameters, open the processing button, the equipment starts to start processing. After completing the current work according to the predetermined amount of processing, the equipment automatically stops processing, and the operator receives the material in the collection. T Company is a manufacturer of digital printed labels with a long history in Germany. The procurement of equipment has very strict standards and requirements. Before choosing GOLDEN LASER, all of its equipment was sourced in Europe. It has been eager to find a small format UV varnish + laser die-cut two-in-one customized machine. 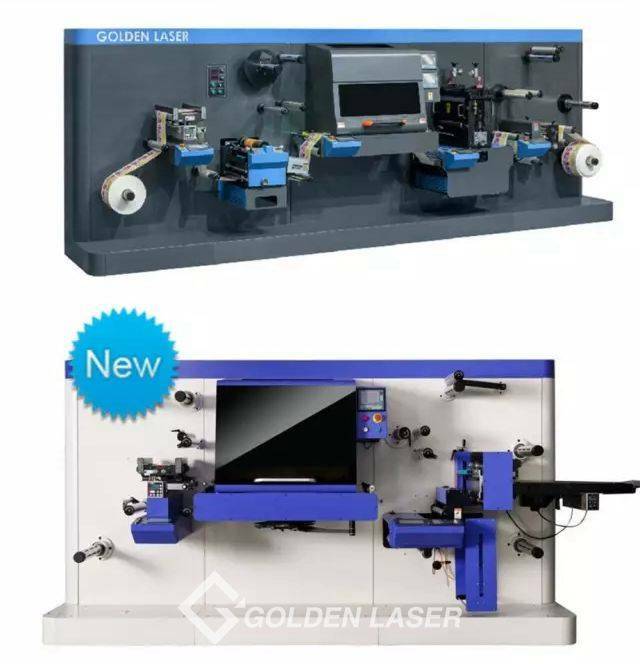 In 2016, for the requirements of T Company, GOLDEN LASER research and development personnel worked day and night, and finally launched the customized-type LC-230 laser die-cutting system. 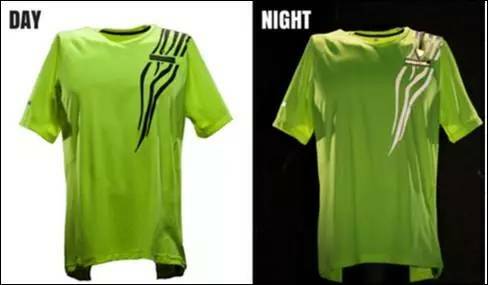 With stable quality and high quality cutting result, get customers highly appreciated. Other European companies got the news and commissioned by GOLDEN LASER to create its digital post-printing series products to meet the personalized needs. E is a printing label manufacturer in Central America for over 50 years. With the increase of orders for small volume customization, the company clearly felt that it was too expensive to cut the label with traditional knife die machine and couldn’t meet the delivery date requested by customers. 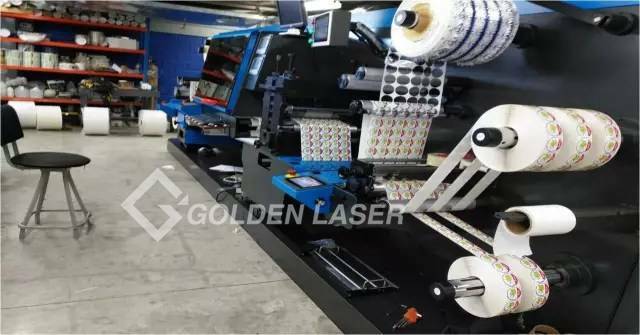 At the end of 2014, the company introduced the GOLDEN LASER LC-350 second-generation digital laser die-cutting processing system, with laminating and varnishing function, to meet customer more customization needs. 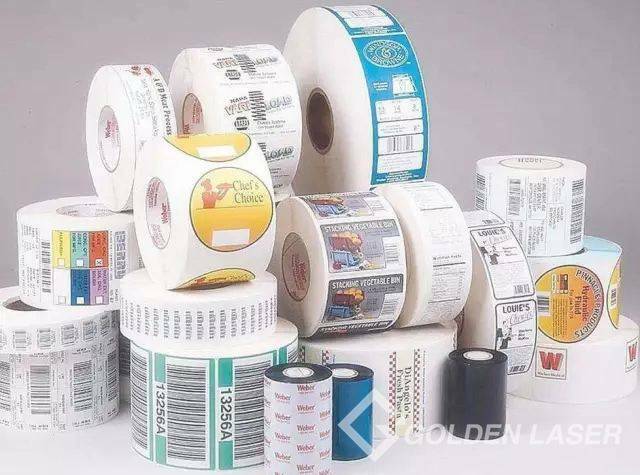 At present, this company has become the largest local printing labels and packaging products production base, won many awards from the local government, and has become the most competitive label manufacturer in the area. X is a North American company with more than 20 years of history of promotional products production company to supply the world’s top 500 companies. The company bought early digital printing equipment. With the increase of orders, especially the growth of small-volume digital orders, the company’s original X-Y laser cutting machine cannot meet its production requirements. In 2015, the company introduced the GOLDEN LASER LC-230 high-speed laser die-cutting system. Laminating, micro perforation, die-cutting and slitting are implemented on one machine, saving time and labor, and creating more value. M, a world renowned label manufacturer, bought a laser die-cutting machine from Italy a decade ago. European equipment prices are high, and maintenance costs are huge, M has been trying to find the same type laser die-cutting machine. 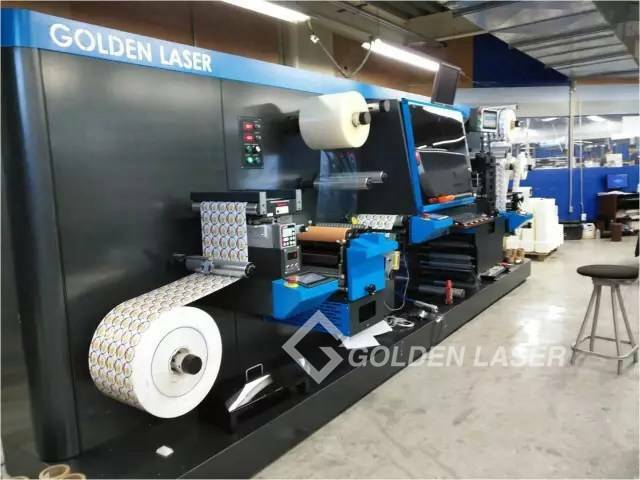 In 2015, at the Labelexpo in Brussels, the client saw the high quality LC-350 laser die-cutting machine of GOLDEN LASER. 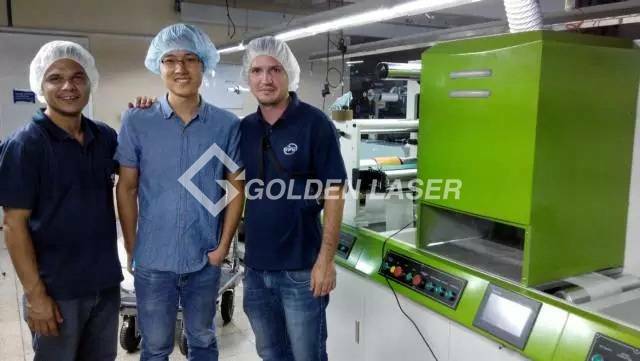 After repeated testing and research, the customer finally chose the more cost-effective GOLDEN LASER LC-350D double-head high speed laser die cutting machine. The system speed up to 120 m/min, additional round knife cutting table and roll to sheet receiving station, for customers to enhance the value-added products. R is the world’s largest textile accessories processing company. This company introduced more than 10 sets of GOLDEN LASER X-Y-axis laser cutting machines many years ago. With the increase of orders, existing equipment cannot meet its production requirements. The LC-230 laser die cutting system has been developed by GOLDEN LASER, mainly used in the cutting of reflective materials. 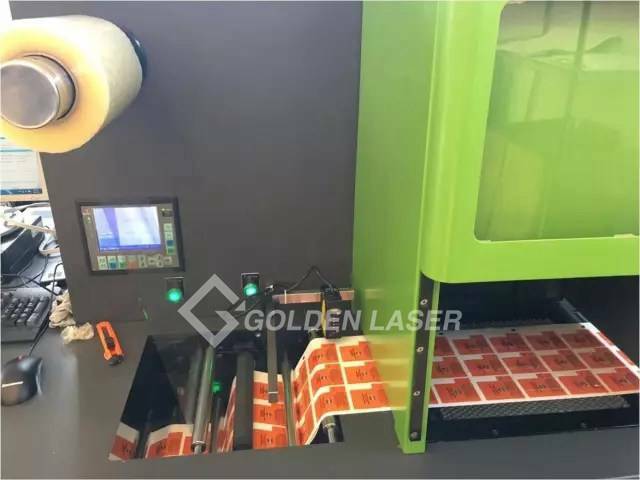 GOLDEN LASER digital printing self-adhesive label laser die cutting solution, with its the characteristics of fast speed, high precision, functional expansibility, intelligent production and automation, for more and more stickers label printing processing manufacturers bring convenience. At the same time, the laser die-cutting solution has more possibilities, which can be expanded to create more value for the user based on the user’s production requirements and solving the actual problem.